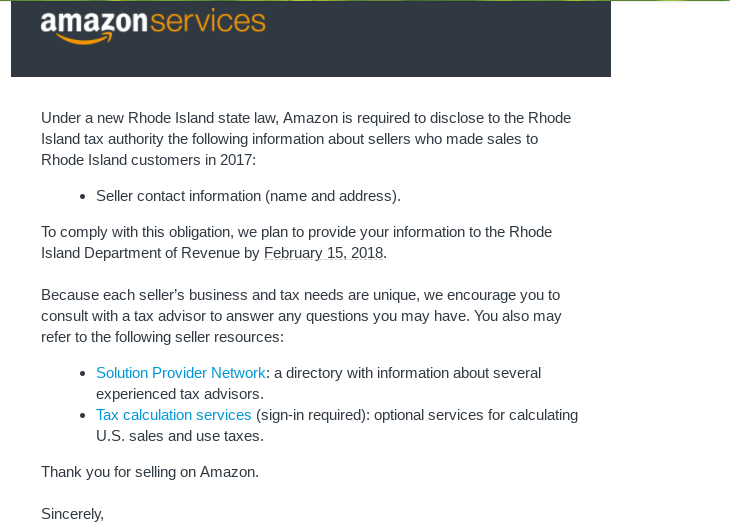 I'm sure many sellers received an email notice yesterday from Amazon informing them that Rhode Island passed a new state law requiring Amazon to disclose seller contact information to the RI Tax Authority if they had any sales in RI in 2017. Before I say anything, I have to tell you that I am not an accountant or a lawyer or any sort of tax adviser. If you received this email from Amazon you should have a conversation with a professional. As far as I can tell, there are a few things to be aware of for Rhode Island specifically but again speak to a professional before deciding what to do. According to the bill, the requirement to collect and remit sales tax in RI seems only to apply if you have sold $100,000+ or if you have 200+ transactions. Thankfully, RI is a small state so unless you are a very large seller (or you sell Rhode Island state flags), you are unlikely to have more than 200 sales in RI. You can see a summary of it here. Update: After reading the bill more carefully it seems that you only have a requirement of notification and reports if you are not collecting sales tax and you are over the 200 transaction or $100,000 revenue threshold. That being said, it seems that if you sold $100 worth of items to any customers in RI during 2017, RI requires you to send notices in the mail to those customers explaining that they have a requirement to pay sales tax on their own. You can read about that here. I'm sure customers will love getting that in the mail. Normally, small sellers might think they don't need to comply because the cost of states going after small sellers wouldn't be worth the payoff. That being said, the penalties here can be pretty severe. If you don't comply with these requirements, there is a penalty of $10 per incident with a minimum of a $10,000 penalty. Therefore, I would take these notices seriously. Recently, other sellers have received a similar email from Amazon about the state of Massachusetts. There may be a similar requirement in Louisiana, Colorado and Vermont. Also, Amazon started collecting and remitting sales tax for all sales, including 3rd party sales, in Washington State starting this year. You can be sure that if states can get more sales tax money, they will begin to write laws requiring Amazon sellers to pay. This is definitely a sign of things to come. Compliance to collect and remit sales tax is a pain if you aren't already set up in that state. It takes time to sign up with each tax authority, calculate sales tax collected each month/quarter and remit each month/quarter. The implementation by Amazon to collect sales tax in Washington State was done very well. 3rd party sellers didn't have to make any changes, sign up for anything, make calculations. It was all done by Amazon who was already collecting sales tax for their own sales in Washington State. I don't mind collecting and remitting sales tax per se, it is the time involved that's the frustrating part. If Amazon began collecting and remitting sales tax on my behalf in all states, I would be in favor. For now, we'll see how this shakes out. Tax Jar may have a lot of money coming its way in the future. You can read more about it in this NY Times article.